Our first ever pilgrimage was to the war-torn country of Yugoslavia, and to the little village of Medugorje, Bosnia.We left from Glasgow Airport on 17.6.94, our chartered flight with it's party of around 100 Scots, some of which had made this trip many times before. I remember how exciting it was for my wife and I, but all I could think about was getting there as quickly as possible. I could not stop thinking about Medugorje since my AA friend, Michael, told me about what had been happening in this little village since 1981. He had given me videos and newsletters a couple of months before our date of departure, so I was preparing myself for what it would be like. I was also thinking that this would be the icing on my spiritual cake the reason being that I was becoming closer to God through the wonderful fellowship of Alcoholics Anonymous and their twelve steps to recovery. My life up until then was like being in a whirlpool of alcohol. My family were expecting it would only be a matter of time before the alcohol killed me. My wife Betty and I had been married for 36 years on 27th December, 1994,We have a family of 3 sons and a daughter. We also have 6 grandchildren. As I sit writing this letter I cannot help thinking of my life in that whirlpool and of the hurt I caused to the people around me, especially my loving wife Betty, who is my jewel in the crown. I was never a serious Roman Catholic and at times I disbelieved that there was a God. Over the years I asked Jesus for help with the state of my life. As time went on I became more spiritually bankrupt, as my illness got worse. It came to the point that I was crying out for help. That was when I was 6 months into my AA programme. I was getting myself ready for one of my AA meetings one night and suddenly a vision of my past alcoholic life flashed across my mind. I then began to cry uncontrollably, from the heart, as if I were a child again. I remember hugging my loving wife Betty and her asking me why I was crying. I could not explain the reason why. I know now that the reason was God. Since that experience I have encountered many more spiritual happenings. 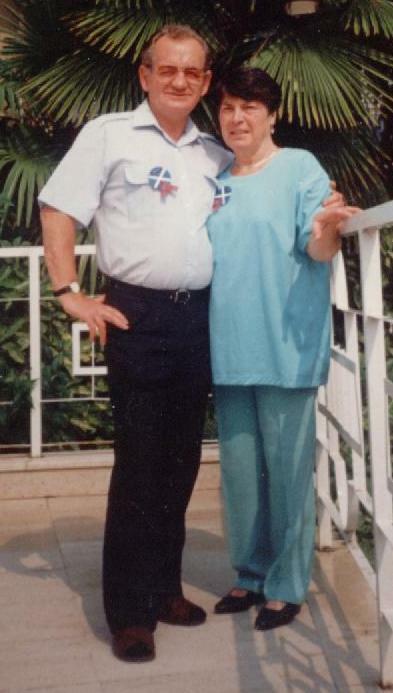 Here is a picture when i was at the start of my pilgrimage to Medugorje on the 17th June 1994 with my wife Betty in the holiday town of opatji. We finally arrived at Pula Airport, Croatia and were taken by bus to the holiday resort of Opatija where we spent the night. Early on Sunday 19th June, 1994 we left for our final destination of Medugorje. We all sang hymns and said the rosary along the way. As I am an HGV driver I proceeded to track the route which the bus was taking on the way. The journey was long and I noted that the driver had failed to stop on occasion at the rest stops. Other than this the journey was pretty uneventful, although was passed through the bullet and bombed villages of the former country of Yugoslavia. We arrived around 10 p.m. My wife and most of our friends decided to go to bed after such a long trip. I remember my friend Danny asking if anyone would like to climb the Hill of Apparitions, as he had hired a local mini-bus to take us the short distance to the foot of the hill. I elected to go with Danny on the bus. I remember so vividly the stillness and the feeling I had as though the world I knew did not exist anymore. I felt so warm and peaceful both physically and mentally. I was saying to myself what in heavens name am I doing here, climbing a mountain somewhere in Bosnia. There were between 15 and 20 people going up the mountain that Sunday night. We all started out as a group, with torch lights, but were soon to spread out as we climbed. I thought of my past life constantly while climbing that mountain, praying for Gods help. Nothing spiritually happened until getting back into the mini-bus, I took the little stone I had picked up from the mountain from my pocket, as one of my friends had told me that this was a practice when visiting the mountain. I remember the excitement I felt on the way back to the hotel. The reason being that when I shone my torch on the stone, there she was, the complete silhouette of the Blessed Mother on the side of our mini-bus. I gave it to Fr. Stevens, one of the 2 priests who were in my party. They all confirmed who it resembled. I know now that this event was only one of many visions of Jesus and the Holy Mother that I was to encounter. In the first week in Medugorje so much happened to me, spiritually, that I could write a novel on all of my spiritual happenings. The most vivid visions happened on the day my wife and I visited the big wooden cross outside St. James Church. I gave a young nun a helping hand to clean the melted candlewax from the grid at the foot of the cross of Jesus. She was just about to start this messy job when it seemed as if a voice said dont just stand there, give her a helping hand. I did just that, I bent down and picked up something to scrape the wax with. The young, beautiful nun reminded me of my only daughter, Barbara, who had just been in hospital prior to our pilgrimage. She was suffering from a severe mental breakdown. Then a young German came along and also started to help. Before long the job was done. I know that it was the most spiritually messy job I will ever encounter in my lifetime. While I was enjoying this chore at the Cross, my wife was sitting saying the Rosary with an Italian lady, who was beside her. I felt so good that day, as if God was making all this happen just for me. I know for a fact that he did. As I sat down next to my wife, I experienced a snapping sensation (just once). Looking down at my right foot there was an imprint of Jesus and Mary, a clear visible mark on the side of my right foot. It was a clear impression of the Holy Crucifix, with Jesus and Mary at the foot of the cross. My mind went into overdrive with spiritual emotion. I dared not excite my wife, as she could not come to terms with my behaviour over the last couple of days. Just then we decided to go and have something to eat at one of the many places not far away. While my wife and a friend we had met enjoyed their ice drinks, I saw a priest who was about to leave. I heard the voice of God telling me to approach him and show him my right foot. He immediately blessed my foot. I am not sure now if the priest thought he was blessing a tattoo. I tried to explain to him how it came to be there. As he seemed to be in a hurry out meeting was brief. I would like to meet up with him again, God willing. At this time I heard voices in my head, telling me that I was God Almighty and possessed all his powers. Sometimes the voices gave me tests to do. These were asking for a commitment to kill myself for the love of Jesus Christ. One night as I was going through one of these tests, my wife was awoken by my coughing. I was trying to swallow my white rosary beads while I was lying in my bed. These are but a few of my spiritual experiences in Medugorje. My condition was probably due to the fact that I was fasting too long. It was very hot at the time and I was also a recovering alcoholic. I finally ended my spiritual experiences in a crazy, bombed out hospital in Mostar, twelve miles away. The police said they brought me there completely out of my mind, I remember coming back to sanity in that hospital and realising the sort of place it was and praying to the Holy Mother and Jesus for help. At this point, I heard a voice telling me that everything was going to be allright and my wife and friends were coming for me. I also became aware of my arms outstretched and handcuffed to the bed I lay on. I also noticed I had a drip going into my right arm. I only know I was in hospital a very long time, possibly over two days and nights. My friends came and got me in Mostar on the Sunday morning. I was last seen on the Thursday night before I went missing. I recall Pat, from Saltcoats, shaking my hand as I came out of a shower. I heard the voice of God telling me to rub my eyes and then I remember the sensation of flakes falling from my eyes, as I gently rubbed them. I now read the Holy Bible daily and I know all the answers to my experiences in Medugorje are there for me to find. I was prescribed heart pills by my doctor when got back home to Scotland. This only lasted over one week, when he told me I no longer need them and my heart rate was normal. I hope to go back someday, to help with the aid convoy or something similar, if it is in God plan for me to do so. I am now involved with spreading the holy message of the Queen of Peace of Medugorje, Bosnia. May all who receive her call, rejoice in spirit, when they arrive in that heavenly little village in Bosnia.